Choose between the mountain climber or the vine climber and between the crawl tunnel or bone bridge. The UltraPlay UP & Down double deck structure is an ideal mid-size 2-5 playsystem where space may be a concern and a capacity of 15-20 children is required. The UP & Down offers five accessible above-deck play events and three below. The UP & Down offers a choice between either the 4 foot Ultra Mountain Climber or the 4 foot Vine Climber for challenging ground-to-deck access. Kids can then take the 4 foot straight slide back down. Above-deck activities include the "Window on the World" lookout panel and the nature-themed sequence game panel. The decks are connected by either a Crawl Tunnel or Bone Bridge. Below the decks, kids will love to play the Bobaloo drum and Bongos as well as give the Rain Wheel a spin. The cozy bench panel can also be found at ground level and is perfect for taking a break or socializing. The UP & Down is available in either the Playful or Natural color palettes. The UltraPlay UP & Down double deck play structure is an ideal mid-size 2-5 playsystem where space may be a concern and a capacity of 15-20 children is required. The UP & Down offers five accessible above-deck play events and three below. The UP & Down offers a choice between either the 4 foot Ultra Mountain Climber or the 4 foot Vine Climber for challenging ground-to-deck access. Kids can then take the 4 foot straight slide back down. Above-deck activities include the "Window on the World" lookout panel and the nature-themed sequence game panel. The decks are connected by either a Crawl Tunnel or Bone Bridge. Below the decks, kids will love to play the Bobaloo drum and Bongos as well as give the Rain Wheel a spin. The cozy bench panel can also be found at ground level and is perfect for taking a break or socializing. The UP & Down is available in either the Playful or Natural color palettes. The UP & Down meets ADA guidelines and is commercially compliant with ASTM & CSPC. IPEMA certified. 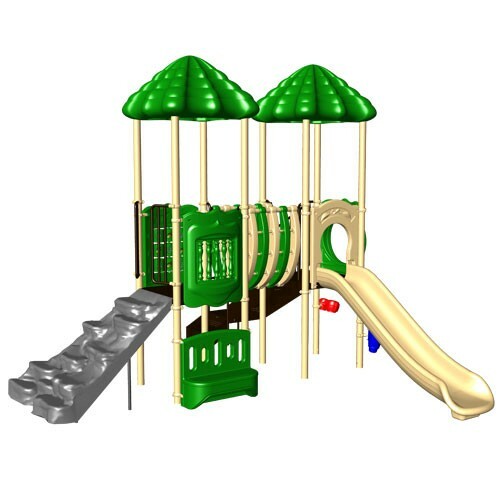 The UP & Down features powdercoated steel posts, coated steel decks and rotomolded and blow molded plastic components. UPlay Today™ playsystems feature a unique, adjustable footer system that accommodates a variety of safety surfacing choices as well as providing for an easy ground spike self-install process eliminating the need to dig and pour concrete footings. Saves money on installation! Ground spikes are included with all structures. Surface mount anchor bolt and inground footer kits are also available, sold separately. Add either in the Design Center when you customize your structure and complete the quote request checklist. The UP & Down is the perfect easy-install, commercially compliant and budget-conscious solution for daycares, churches and apartment complexes! Assembly required. Truck delivery.